The group of plants that includes Onions, Garlic, Shallots, and other pungent species, also includes multiple ornamental Allium varieties. These showstoppers add rhythm and motion to the landscape and love to take center stage in a sunny, well drained garden bed during the spring and summer. Alliums attract butterflies and other pollinators and make excellent, long-lasting cut flowers. Flower heads, which can range in size from 1-2 inches all the way up to 10-12 inches, can be dried on their stalks. Alliums are deer and rodent resistant due to the cysteine sulfoxides present in their leaves, stems, and flowers. 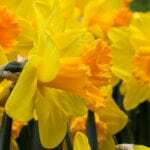 That means you won’t have to fuss over how to protect these bulbs and their flashy flowers. Many Allium varieties begin the growing season with a healthy shock of basal leaves that later retreats into the ground just as the tall, leafless flower stalks appear and begin to bloom. The fading foliage can be less than attractive, so be sure to select companion plants like Catmint (Nepeta), Geum, or dwarf ornamental grasses that will leaf out just in time to cover the declining Allium foliage. You may also want to plant your Alliums in groups between perennials, with low-growing ground cover (such as Phlox subulata), and in borders and cutting gardens. These plants bloom in a gorgeous array of hues. Globe Master (Giant Allium) produces the largest spherical flower heads of all Alliums — approximately 8-10 inches in diameter. The perfectly-formed spheres are comprised of tiny, compact vibrant purple flowers atop 40- to 50-inch-high flower stalks. They bloom from May to June. 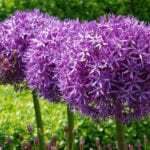 Allium Gladiator has 6 inch spheres comprised of rich rose-purple florets. Gladiator blooms early summer and reaches 3-4 feet tall. This giant onion has spheres slightly smaller than Globe Master and is a true standout! Mont Blanc, grows 3-4 feet tall and sports lovely globes of pure white flowers that are 3-4 inches in diameter. Nectaroscordum, or Allium siculum (Mediterranean Bells), produces clusters of nodding white flowers with pink centers. This Allium has bell shaped flowers and is a favorite of Hummingbirds. This variety grows to 36 inches tall. Purple Sensation, which also hits 36 inches, is a popular variety that produces vibrant jewel-tone spherical blooms which are 4 inches in diameter. This well-loved variety has earned the Award of Garden Merit. Pink Jewel is an elegant and appropriately named variety that reaches 32 inches tall. Atropurpureum, a 24-inch variety, delights with a maroon bouquet-like bloom with an upright habit. Purple Rain has large 4-inch dark purple spheres that look like exploding fireworks. It reaches 36 inches tall and blooms in June. Moly is a yellow flowering Allium growing to 18 inches tall. It has ½ inch diameter bright yellow star shaped flowers that appear May-June. It naturalizes readily. Schubertii (Tumbleweed Allium) sports wide-open rose/pink flower heads resembling fireworks formed on short 16-inch stems. The open seed heads persist for months, offering added interest in the garden. Christophii (Star of Persia) has 10-inch globe-like amethyst flower heads on 14-inch-high stalks. Summer Drummer is the latest blooming Allium and tallest growing one as well. It grows 5-6 feet tall and has large grape fruit size spheres comprised of purple and white florets. It blooms July to August. 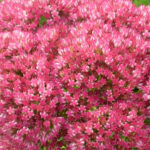 Ostrowskianum produces clusters of larger-petaled pink flowers on 10-inch stems. Moly, which also produces 10-inch stems, is known for its loose, yellow blooms. 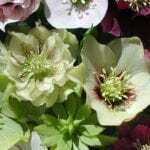 These varieties will spread and multiply over time making them great for naturalizing. Keep your Allium display growing strong throughout the spring and summer with a combination of these high-performing, easy-to-grow bulbs. 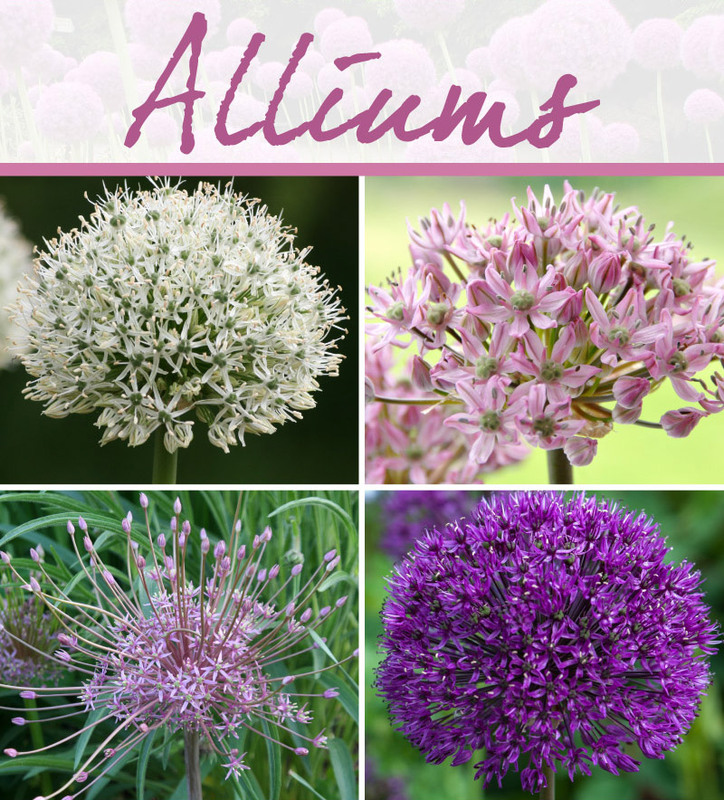 Rohsler’s has a great selection of Alliums and our experts will be happy to assist you with your choices.